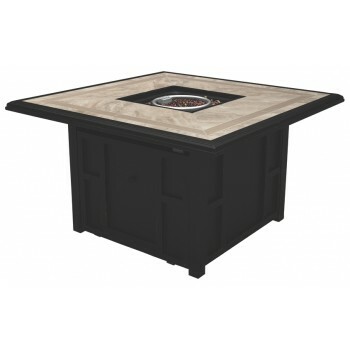 Turn your backyard entertainment area into the hottest spot in town with this outdoor fire pit table. Natural porcelain tile in rich neutral tones gives the square fire pit tabletop an upscale aesthetic. Push-button battery-operated ignition adjusts with the turn of knob. A sliding slide door provides easy access to your propane tank. When not in use, top with the burner cover for an expansive coffee table loaded with contemporary flair.